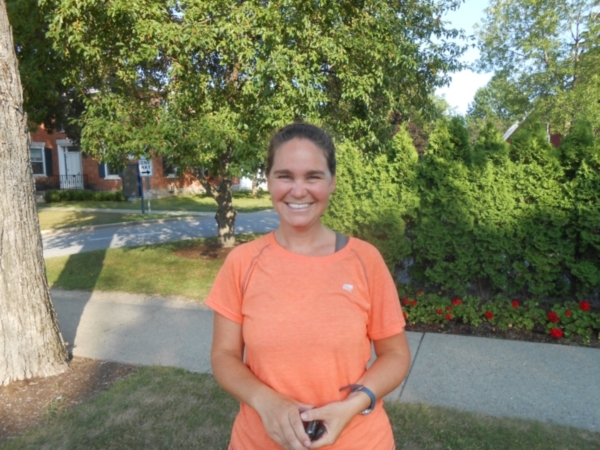 On August 6, I missed a turn and lost about 3 hours, adding about 25 miles to my day. When I realized I was off route I called Terry. I had phone service! I had to leave voice mail. What I did not know was when she tried to check voice mail, she was getting her own message instead of the mail box. I have had this problem with t-mobile before. When Terry saw Rod McDonald and Denny Andrie with loaded touring bikes she asked if they had seen me. If I had not been off route they could have. They were planning to stay at a hostel that night. Terry went over to arrange for us to stay also. It was 20 dollars for the night. The owner provided us with fresh eggs for the morning. Denny and Rod came down to visit. They both live in the Seattle area. It turned out that we had met some of the same people, including Ken Gomez from the Syracuse, New York area and his cousin Bill. I met Ken and Bill in Shelby, Montana. I was amazed by his detailed listing of sites to see, diners, places to stay and warmshowers.org hosts. Ken had to cut his tour short. He had recently sagged for Rod and Denny in the Adirondacks. They asked if I would like to ride with them Tuesday. We started about 7:00am. That is the day we stopped for the pictures with lobsters posted earlier. The Adventure Cycling maps give great information about places to camp. 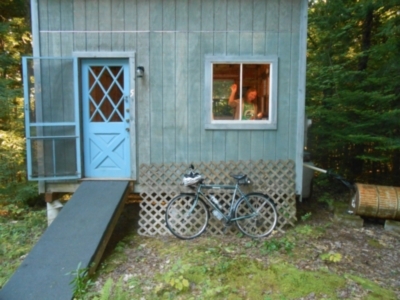 I found a listing for cyclist only camping with a request to call ahead. I left voice mail. It was another day up and down hills. We arrived at Alex Allmayer-Beck’s house in the late afternoon. I was checking voice mail for a response from Alex when he opened the door. He has been involved in cycling since 2004 and is a gracious host. As he escorted us to the backyard, Rod spotted the 173rd Airborne bumper sticker. It turns out that he and Alex had both served in Vietnam with the 173rd. What a coincidence. Alex and Rod shared stories and memories throughout the evening. Alex drove us to the grocery store to pick up dinner and supplies and gave us a quick tour of Belfast. Alex has been CEO of the local soup kitchen for the last two years. He has been successful in building coalitions of people to help those in need and finding volunteers. His plans include renaming the organization to the Belfast Community Kitchen. The town is thriving. I think Alex will accomplish his goals for the program. Wednesday morning was foggy as Denny, Rod and I anticipated our last day of riding. Our energy was high. Down the road from Belfast, Rod spotted three loaded touring bikes. We found the riders in a cafe. Natasha is from northern California, Robert is from Arkansas and Phil is from Michigan. We must have talked for nearly an hour. 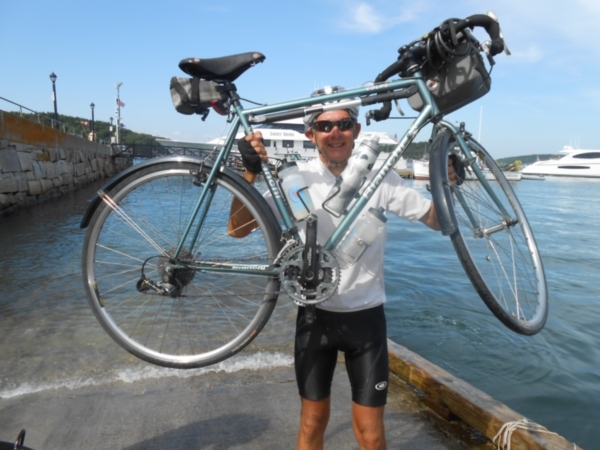 We rode together to Bar Harbor. It was an amazing day for six of us to complete our dream of riding coast-to-coast together. We were less than 70 miles from our goal. Robert, leader of the other group, did a great job keeping us together. Denny, Rod and I were riding without gear. The others still had their full loads. 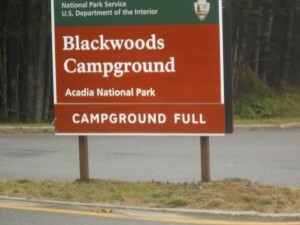 At lunch, Robert mentioned it would be good to reserve a campsite at Acadia National Park for the evening. I was having trouble with my phone. It showed that I had service, but I couldn’t hear anything except the voicemail messages that were recorded to the phone. I borrowed a phone and called Terry. She didn’t want to give up her parking spot, but went to the park to see what she could arrange. 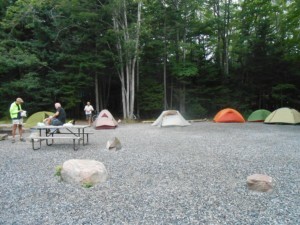 Terry was told the campground was full! It turns out, however, they had one group campsite left. They didn’t think anyone would want to pay the $50 fee. With seven of us, including Terry, the site was perfect. Terry lost her parking spot, but was able to make provision for all of us to camp after our final day of riding. Our neighbors were two troops of Boy Scouts. They were good troops with great leaders. Riding up and down hills on the Northern Tier Route requires a lot of shifting. At times I shifted more in a day than I might in a month at home. 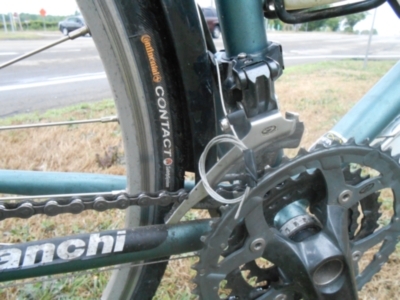 The continual shifting caused the front derailleur cable to break on July 26 in Evans, New York. Fortunately, I had a spare cable. In a short time, I changed out the cable and started riding again. 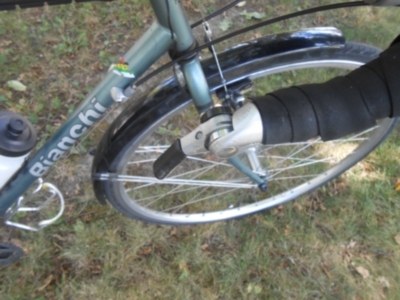 My Bianchi Volpe was fitted with Shimano Dura-Ace bar end shifters. Before the cable broke, shifting became more difficult. After I installed the new cable, shifting was much easier. The next time I was near a bicycle shop, I picked up a spare derailleur cable. With a front derailleur, when the cable breaks, the chain moves to the smallest chain ring. This lets you ride, but limits your range of gears to adapt to the terrain. You are stuck in the low range. I knew if the rear cable broke, the chain would move to the smallest rear cog, leaving me in a relatively high gear regardless of which chain ring was used in the front. 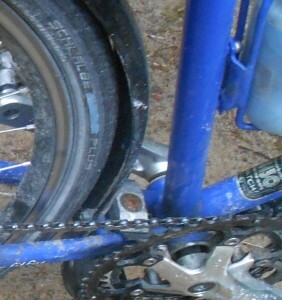 Eventually, the rear derailleur became very difficult to shift. Rod, Denny and I spent Tuesday night, before our last day of riding, camping in Alex Allmayer-Beck’s back yard. Alex told us he had every tool in the Park Tool catalog and asked if he could help with any problems. I mentioned the shifting on my rear derailleur. He said there was a simple adjustment. The next morning it only took him moments to tell me it was a cable issue, not an adjustment. Alex helped me get the new cable installed and adjusted. The old cable had failed. Broken strands of wire were jamming at the end of the housing. The shifting improved dramatically after with the new cable. Maine is full of hills, all the way to Bar Harbor on Mount Desert Island. I was really glad to have easier gear selection again. 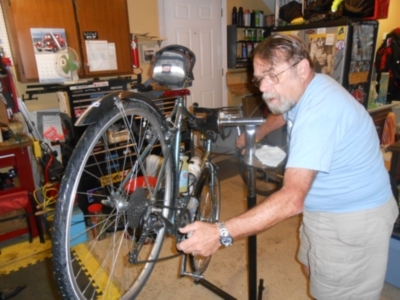 For many people the ride across America might represent many years of riding and shifting, still it pays to check the condition of your shifting cables, before they break or become difficult to shift. 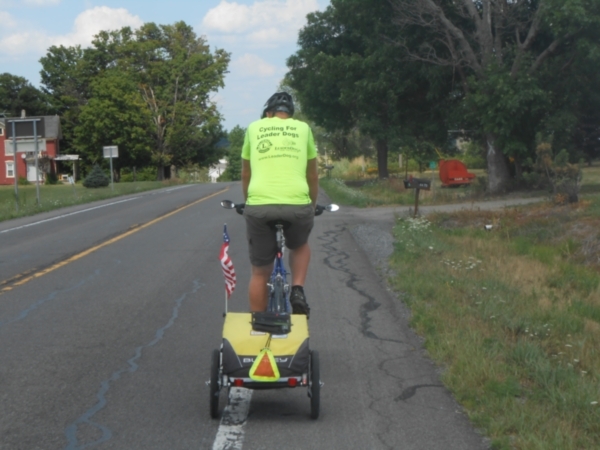 As amazing as it may seem, I did not have any flat tires in my 4540 mile bicycle ride coast-to-coast across the USA! I did wear out the first set of tires. I rotated the front to the back in Circle, Montana and replaced those tires on my rest day at home in Illinois in mid-July. I installed a set of Continental Contact tires 700c x 28mm. These were a little narrower than the tires I started on. the Continental Contact tires had less rolling resistance. According to the advertising they have Continental’s SafteySystem. “The SafetySystem Puncture Protection is made of a strong and tight Nylon fabric. This fabric is additionally reinforced with Kevlar®. The result is a tire construction that is highly resistant against pinches and cuts.” One of the common hazards for a bicycle tire on a tour is the debris and small pieces of wire from failed truck tires that litter the shoulder of the highways and by-ways. Puncture resistance is a big plus. 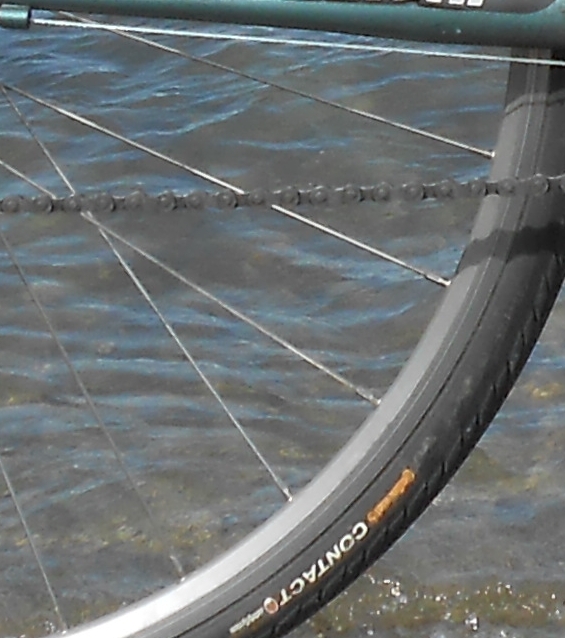 Many of the touring cyclists that I met had fitted Schwalbe Marathon tires, usually 700c x 32mm or larger. The Marathon comes in a Plus or Supreme versions. These tires have a reputation for being very durable and capable of long life. The Specialized tires that I used at the start of the trip seemed to wear faster and did not roll as easily as the Continental Contacts. Remember this is not a direct comparison, since the Contacts were a narrower tire. The tread and casing design seems to be superior on the Continentals. 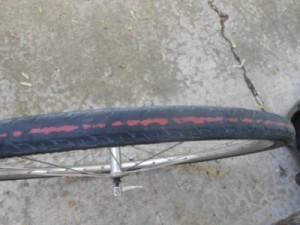 I didn’t have any flats on the Specialized tires for more than 3200 miles, so they did a good job too. I wore them down to the Kevlar under the tread. I tired to keep these tires inflated to about 75psi. I know that some of the time they were down around 60psi. A heavier rider might well have experienced problems at that pressure. Outside Rockport, Maine on August 7 Rod and Denny wanted a picture with lobsters. At $3.99 a pound, the live lobsters seemed like a real deal. Unfortunately, we had no way to carry or cook the lobsters. 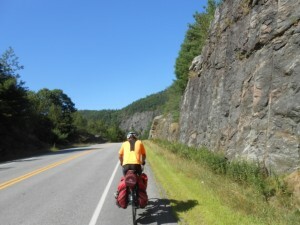 The thrill of riding into Bar Harbor to complete a 4540 mile cycling tour from coast-to-coast, across America was amazing. It was a very emotional moment. I took off ahead of the rest of the group down the last real hill. I really had to watch the cars. I was riding 34mph in a 30mph zone, yet the car behind me just had to get by. I felt my throat getting tight as I crested a little hill, getting my first glimpse of a few houses in Bar Harbor. Rod caught up with me at the stop sign and told me to go left. We could only coast along because of all of the people in the street. At the foot of the hill we turned right bringing us to the Atlantic Ocean. Terry arrived very soon after we stopped. I met Rod and Denny, Monday evening. We rode together to Belfast on Tuesday. Wednesday morning we me Natasha, Phil and Robert at a cafe along the route. 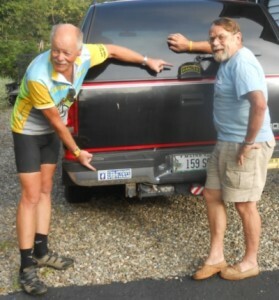 We soon decided to ride together to Bar Harbor, less than 70 miles from that point. While we had started from different locations, on different days and followed somewhat different routes based on Adventure Cycling Associations Northern Tier route; we were all finishing the dream and goal of riding across the USA. 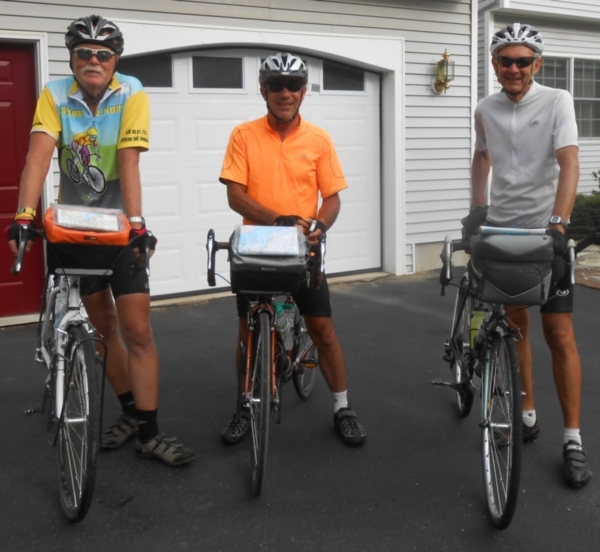 We all enjoyed riding together, sharing stories of the events, towns, and people along the way. The day seemed to pass very quickly. Rolling our front wheels into the Atlantic was a very special moment for each of us. From left to right: Rod, Phil, Natasha, Robert, Shular and Denny. Bar Harbor – I finished the ride. 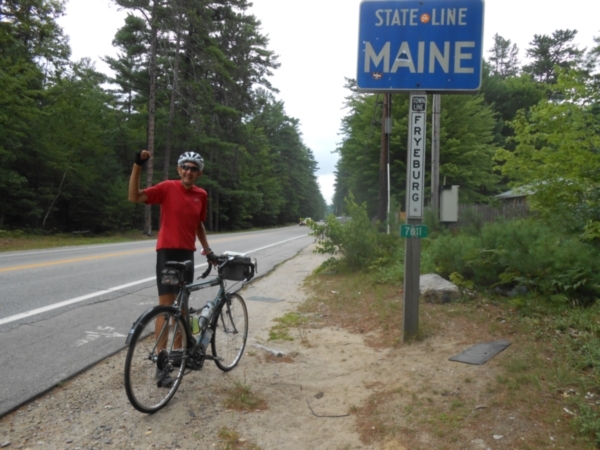 Day 74 – Wednesday, August 8 – I completed the ride at the Bar Harbor pier. Five more riders finished with me. The thrill of achieving a major goal is amazing. I have many pictures and stories to share. 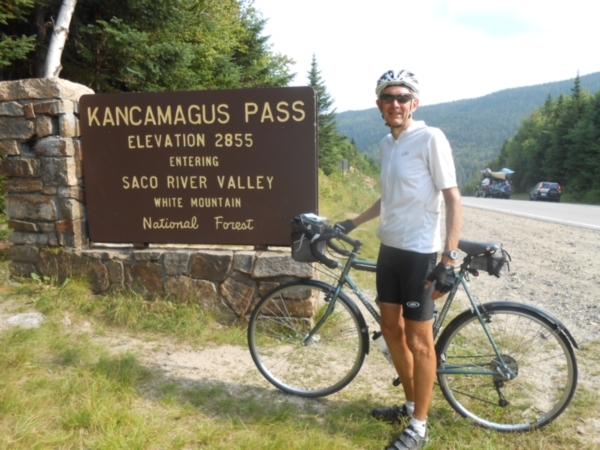 Kancamagus Pass was the last mountain to climb on the route. The grade at times was steep. I was glad I was not pulling the trailer on this segment. One segment exceeded 12%. 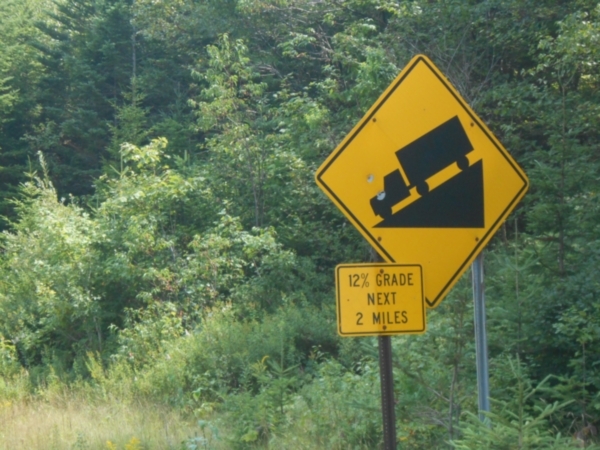 I did get a good downhill on the other side. Terry really wants to see a bear. 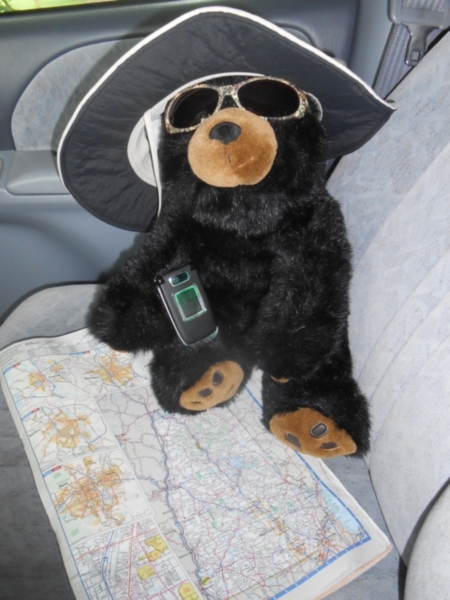 So far her navigator is the only bear she has seen. 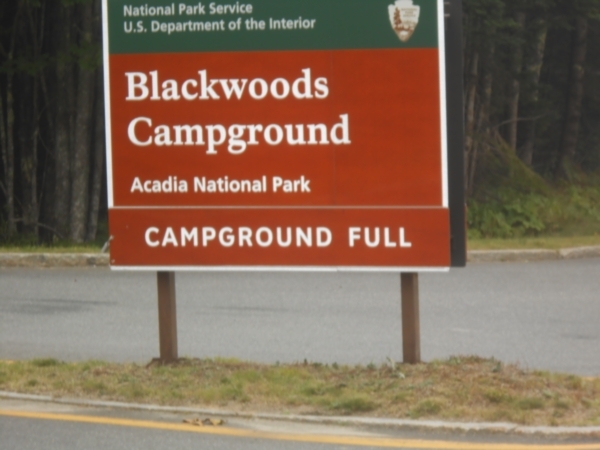 The first campground in the White Mountains National Forest had a FULL sign. 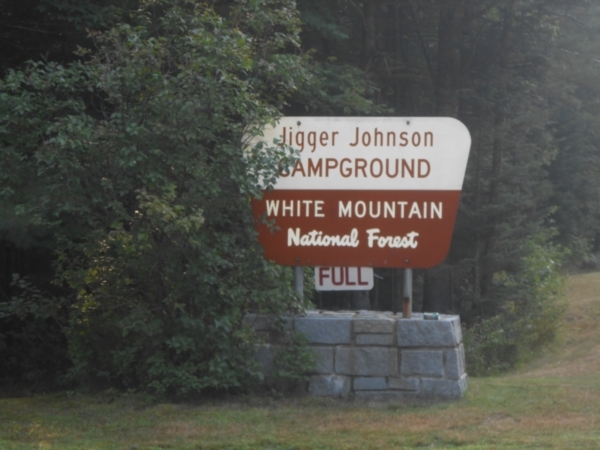 I wondered about our destination – Jigger Johnson Campground. The traffic was very busy all day. The noise, especially those V-twin engines on a popular brand, frequently fitted with loud pipes, was about the worst on the entire trip. The picnic and trailhead areas all had many cars and people. Terry went ahead to see about the possibilities. She found the campground manager and pleaded her case. He said to check to see if site 26 was taken, and if not put some gear there. She raced back to tell me. After just over 70 miles of riding with a lot of hills, I was glad to have a place to rest. Terry wants to see a Moose also. 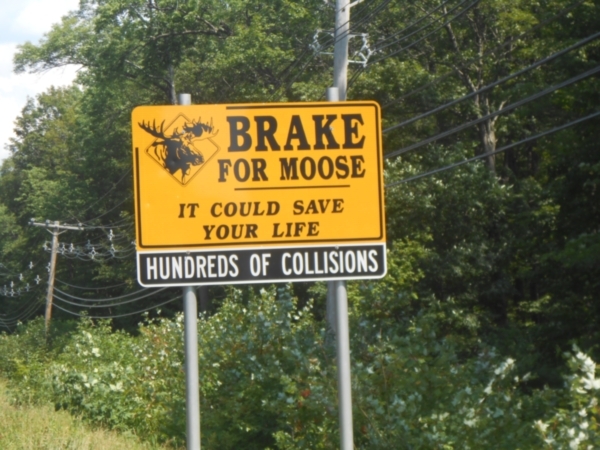 When I saw this sign, I thought surely this is the right place to see a moose. She is still waiting. There is still a chance, but the opportunities will be more limited as we continue the ride. Sunday morning traffic was light for only a short time this morning. 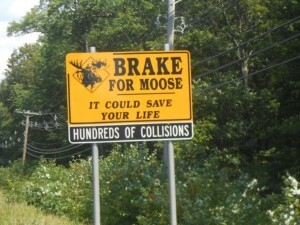 I was glad that we changed routes shortly after entering Maine. The Last state on the route! We are camped near Shaker Village. Now only 176 miles to the goal of Bar Harbor. I expect to arrive on the pier at the end of the route Wednesday. 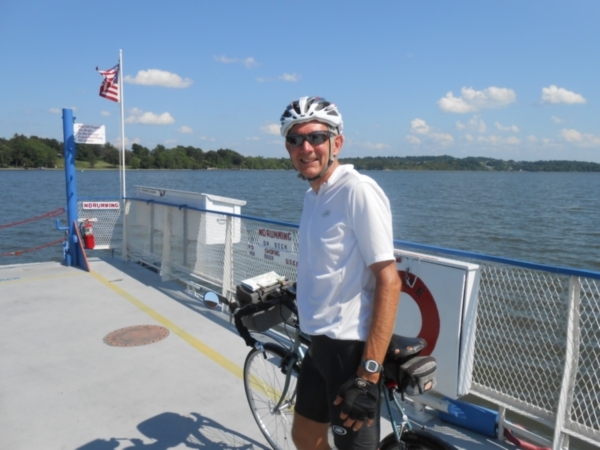 On Thursday, August 2, I crossed Lake Champlain on a ferry boat. The operator told me he had recently turned 74. He’s been on the job 46 years. The short ride brought me the Vermont side I rode on to Middlebury. I stopped to talk to Terry about camping for the evening. My original goal of Hancock was too far. That is when Jan showed up. She looked at the map and discussed the merits of several campgrounds. She called her husband to get the phone number for Branbury State park located on the eastern shore of Lake Dunmore at the base of Mt. Moosalamoo. The attendant offered to leave a map marked with available sites. We enjoyed our brief stay their before starting todays route. I started climbing Bread Loaf and Middlebury gap this morning. Some of the grades approached 16 percent. This made for long slow climbs. I had more climbing in the afternoon, but not quite as steep. 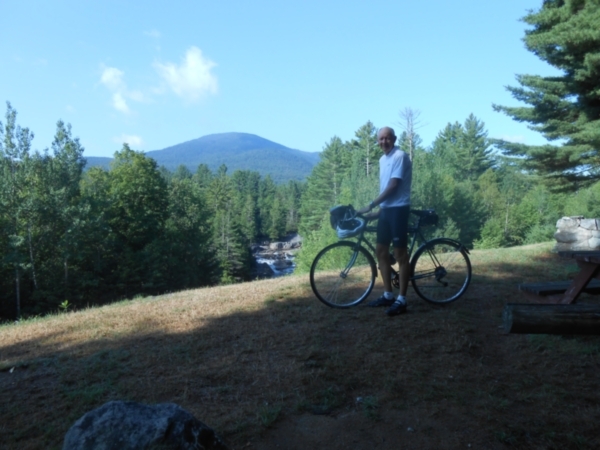 In the late afternoon I rode into New Hampshire. I soon discovered River Road, designated on my route was closed. I rode to Lyme. I was looking at the map and talking to Terry about where to camp when a fellow across the street came over with local knowledge of campgrounds. It turns out that he has ridden coast to coast. He suggested the Pastures in Orford. It was 9 miles away and mentioned on my map. We are camped at the Pastures tonight on the Connecticut River. The wi-fi is great, the bathrooms are clean, an no quarters needed for a shower! There is more climbing tomorrow. I am now just over 300 miles from Bar Harbor. Terry took a picture of me this morning with the Blue Ridge Falls in the background. We camped on this site last night. Today is day 67. I will be riding into Vermont today. It is great to finally have Internet access and phone access. I was with out phone service in much of upstate New New York t-mobile is not available in most of the Adirondacks. I was caught in a rain storm yesterday afternoon. We camped at the Blue Ridge Campground. I recommend it for touring cyclists. 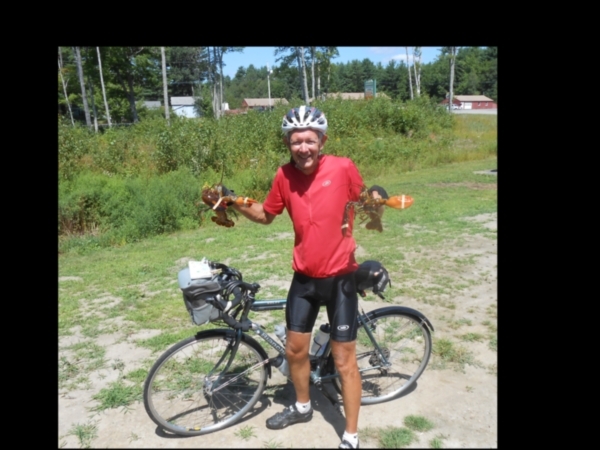 I met Mark Mansell Monday afternoon as we neared the Adirondacks. Mark is a member of Lions Club from near Portland, Oregon, cycling from Portland, Oregon to Portland, Maine. He is raising money for Leader Dogs for the blind. 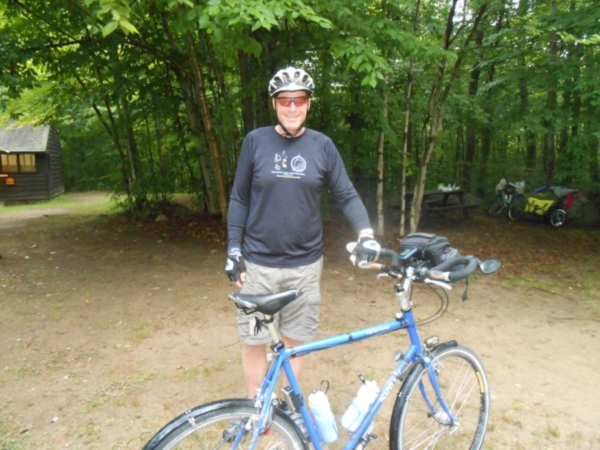 He has already raised more than $60,000 Learn more about Mark and the program at http://www.CyclingForLeaderDogs.org. Mark is pulling a Burley trailer to stow his gear. We had a very enjoyable time riding together and camping to nights. Mark plans to be in Portland to finish his ride this coming Monday. Then it is back to responsibilities as a school superintendent. In Booneville, New York a lady ask if I had a tool to open a special remote device her friend needed to drive. The batteries had failed. My tools didn’t fit, but Mark had one to do the job.